Apart from using VPN with wireless network, using WPA/WPA2 is another secure option. This is a secured wireless connection method with data encryption over the air. 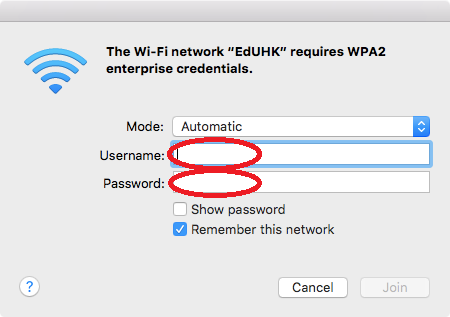 Using this method, any user with a valid EdUHK network account can access the Internet as well as the EdUHK Internal network wirelessly, just like using a computer connected to the campus network with wired connection. To make such a connection, you need to setup a profile using the wireless connection utility available in your device. 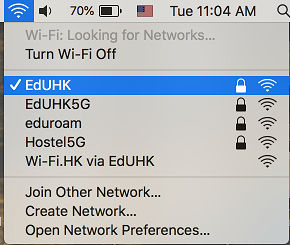 There are three SSID for the EdUHK wireless network, the "EdUHK" or "EdUHK5G" * is for WPA/WPA2 enabled connection and "Wi-Fi.HK via EdUHK" is for guest with no encryption settings and also used for VPN. * Most of the high-end mobile phones support dual radio band Wi-Fi (2.4GHz or 5GHz) and automatically pick the radio frequency band based on various criteria. For some usages, if users want to stick to the 5GHz band which is less noisy and support faster speed, they could select the EdUHK5G or Hostel5G (in hostels only) to force the mobile devices to use the 5GHz band. Setup Wi-Fi on Microsoft Windows OS. Setup Wi-Fi on Apple Mac OS. Setup Wi-Fi on Apple iOS device. Setup Wi-Fi on Android device. Click the "Internet Access" connection icon on the task bar. The system will scan for available wireless network within the area. Locate and press "EdUHK". Then click the "Connect" button. 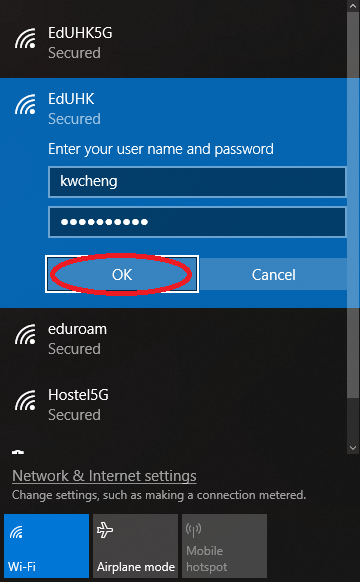 Enter EdUHK login name and password as requested and press "OK". 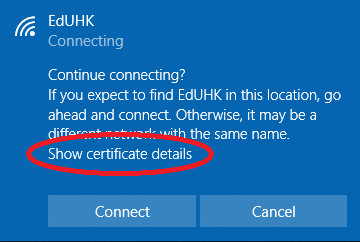 Then you will prompt to accept the certificate, press "Connect" to proceed. Now you may surf the Internet (e.g. 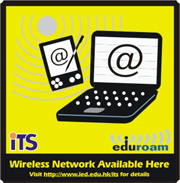 using Internet Explorer, Chrome or Firefox) over the EdUHK wireless network. Click the AirPort wireless connection icon on the task bar. The system will scan for available wireless network within the area. Locate and click "EdUHK". Enter user name and password as requested. Then click the "Join" button. Now you may surf the Internet (e.g. 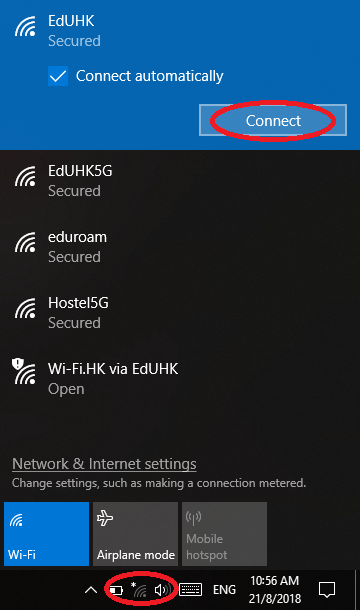 using Internet Explorer) over the EdUHK wireless network. Go to "Settings" page and choose "Wi-Fi". The system will scan for available wireless network within the area. 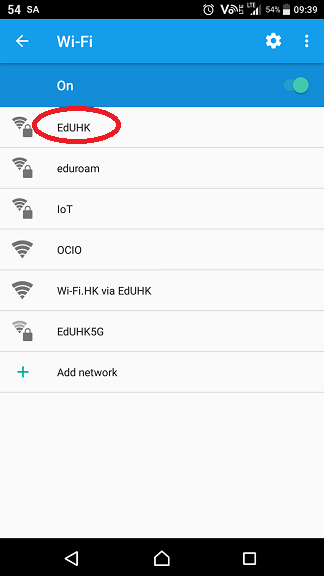 Locate and press "EdUHK". 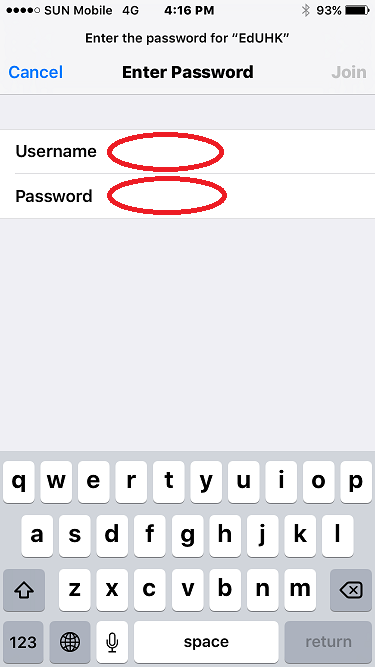 Enter your EdUHK login name and password for "Username" and "Password" accordingly. Then press the "Join" button. 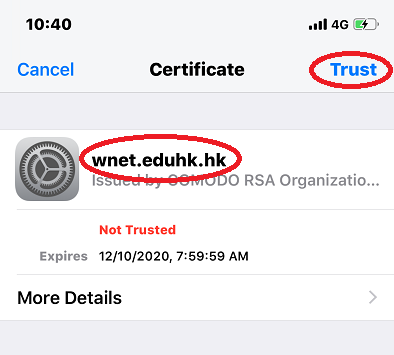 Press "Trust" when prompt for the following certificate. Now you may surf the Internet (e.g. using Safari) over the EdUHK wireless network. Go to "Settings" page and choose "Wireless & networks". 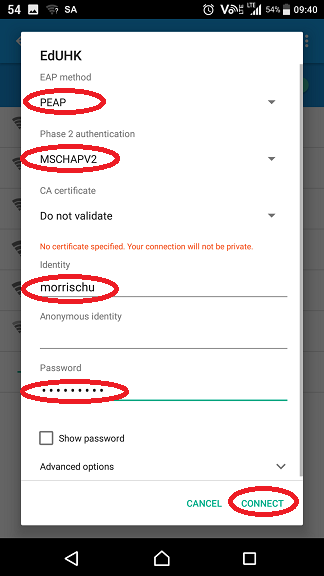 Please select "PEAP" for the EAP method and "MSCHAPV2" for the Phase 2 Authentication. Then enter your EdUHK login name and password for Identity and Password accordingly. The field Anonymous identity can be left blank. Lastly, click Connect. 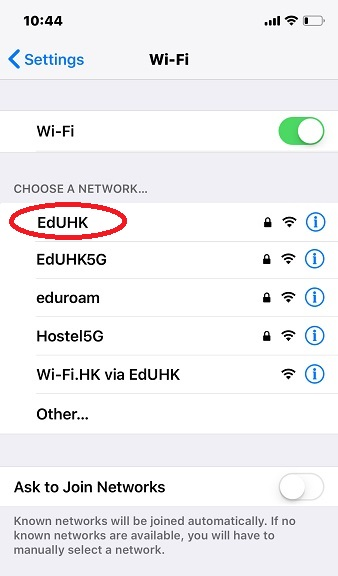 Now you may surf the Internet over the EdUHK wireless network.